Last week we went over the common types of exterior signs we make for businesses. While advertising your business at its location is important, indoor signs for branding, decor, and wayfinding can be just as important. The first thing a client or potential client sees when they enter your business is your lobby, which is why many companies will invest in a lobby sign. Especially if you’re trying to build brand recognition, you want to repeat your logo and logo colors as much as you can. Most companies will have their logo displayed identically on their building and on their indoor wall. 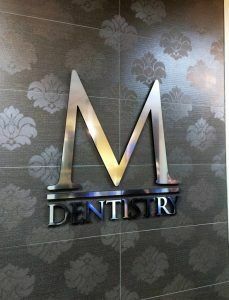 We can create lobby signs using individual letters, use a backer to display your logo, and even illuminate it. Vinyl is an affordable way to customize your decor. We can cover virtually any flat surface with whatever you would like in vinyl form. 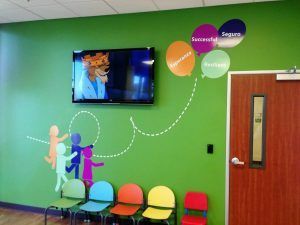 Using our wide format printer, we can digitally print any image, color, or pattern onto large pieces of vinyl so we can create huge lettering, or even cover full walls with you logo, an image or a message. Etched vinyl is also an elegant way to decorate the inside of your office. When etched vinyl is applied to glass or plastic, it gives it a frosted glass effect. You can either have your logo cut out of etched vinyl, have a pattern cut out, or even cover some or all of a window or door for privacy. ADA compliant signs are required in some buildings by the Americans with Disabilities Act of 1990. These signs include Braille or raised text to help those with visual impairments read the signs. 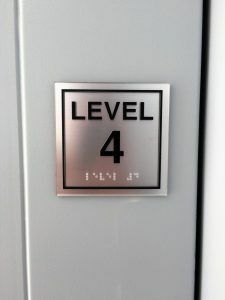 There are many regulations and rules for ADA signs which we are experts in and can help you make sure your interior signs are ADA complaint. ADA signs can be anything from room ID signs to restroom signs. When you work with us, we can customize the colors and style while still making sure that you are meeting ADA compliance. Cabinet signs are commonly used as building signs and can be illuminated so the image can be seen at night time. We can make the same type of sign and install it inside of your business to display necessary information or just an image that helps improve your interior decor. Using digital printing, we can display anything you would like and illuminate it beautifully. Check out last week’s blog if you haven’t already to learn about different exterior signs. Now that we’ve covered signs for both outside and inside of your location, next week we’ll be taking to the streets with vehicle signs.